GS Moon 260cc-1 is the first released buggy of the GS Moon 260 series, GS Moon 260cc-2 is the second type released by GS Moon. The 260cc-1 has a specific look, with its angular shape, the GS 260cc-2 has his own appearence. These buggies show that the buggies are suitable for both young and old. The engine of the GS Moon 260 is a converted scooter engine with integrated forward and reverse gear with differential, which makes it easy to maintain the buggy yourself. The GS Moon 260cc has a CVT (automatic transmission), making driving almost automatically. Also, the GS Moon 260cc is equipped with a differential shaft, making it easily to go through curves. GS Moon 400cc has the same appearance as the GS Moon 260cc-2, only this type is a little bigger than the GS Moon 260cc-2. Due to the larger size, the GS Moon 400cc is very suitable for larger people. The fun is no less! 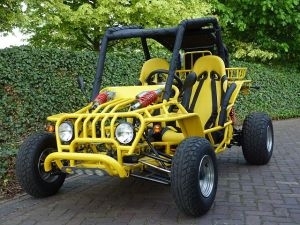 Because of its larger size, both in length, width and height this buggy has a cool appearance and clearly his own image. Like his siblings, the GS Moon 260cc-1 and GS Moon 260cc-2, this buggy has a CVT (automatic transmission), often used in an ATV or Quad. Also, the GS Moon 400cc features high and low gear, so it is difficult to imagine that you get stuck in the mud, of course only when you have the right tires. Note: old model GS Moon 260cc is up to construction year 2008, new model GS Moon 260cc is from construction year 2009! !